If you've rented a car in the Rhineland on your adventure through Germany and want to drive along the Upper Middle Rhine Valley, there are a number of great destinations along the way. 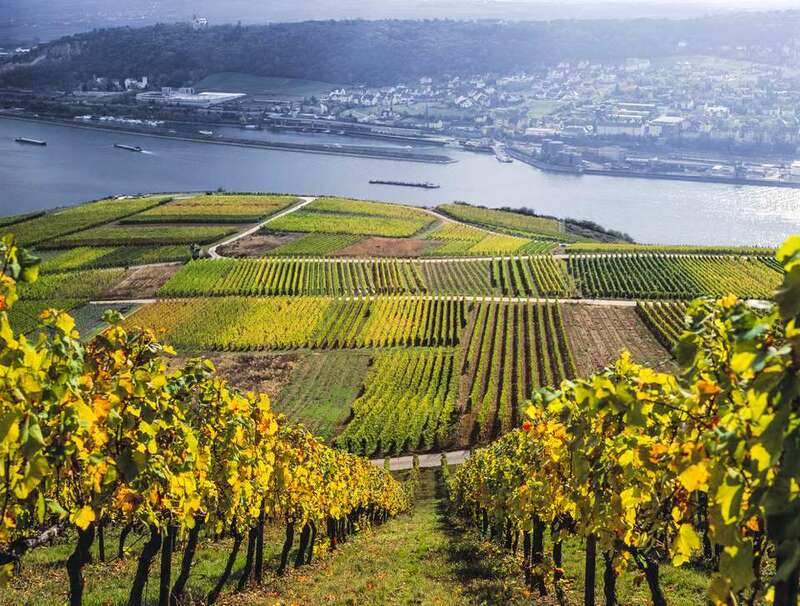 For the purpose of this guide, your journey will begin on the German Wine Road in Rhineland Palatinate, which should take a couple of days to explore. Next, we'll take you up the Autobahn A 61 to Bingen, the gateway to the dramatic natural landscape of the Upper Middle Rhine Valley—a UNESCO world heritage site—which stretches 40 miles from Bingen to the city of Koblenz. Your subsequent drive along the route B9 through the river valley follows the loops and sways of the Rhine through terraced vineyards. As you travel, you'll see castles perched on steep hills, some of which are in ruins but most are picture-perfect homes to museums, restaurants, and even hotels. For some excellent photo opportunities, make sure to stop at the Maeuseturm (right behind Bingen) and at the castles of Rheinstein, Reichenstein, and Sooneck. The recommended next stop is the city of Bacharach, one of the best preserved medieval towns in Germany. To get your bearings, we recommend taking a walk atop the 600-year old city wall with its original guard towers (one of them houses a hotel), then meandering through the streets of the village which are filled with historic timber-framed houses. There is no shortage of good and atmospheric restaurants in Bacharach; look out for a "Weinstube," a traditional wine tavern, which serves regional fare and wine from the steep vineyards surrounding the town. Also try to stop at the timber-framed restaurant “Altes Haus” from 1368, the landmark of Bacharach and one of its oldest buildings. We typically recommend only a day in this city, but if you want to stay a little longer here, how about spending the night in a castle? Castle Stahleck, which towers over Bacharach, has been turned into a hostel—a fantastic option if you travel on a shoestring (private rooms are available). There are also a number of other fantastic castle hotels in Germany, so do your research before you embark on your journey through the Rhineland so you can best determine whether or not you want to stay in Castle Stahleck or continue your adventure. From Bacharach, follow the Rhine until you reach Koblenz; after a visit at Castle Stolzenfels, built in the 13th century and beautifully renovated to its original splendor, you can cross over to the other side of the Rhine to spend the night in Braubach’s "Landgasthof Zum Weissen Schwanen” (Inn to the White Swan). Located right behind the former village tower, the hotel is set in a former mill from the 13th century; you can even see the preserved wooden mill wheel, which is displayed inside the timber-framed hotel. 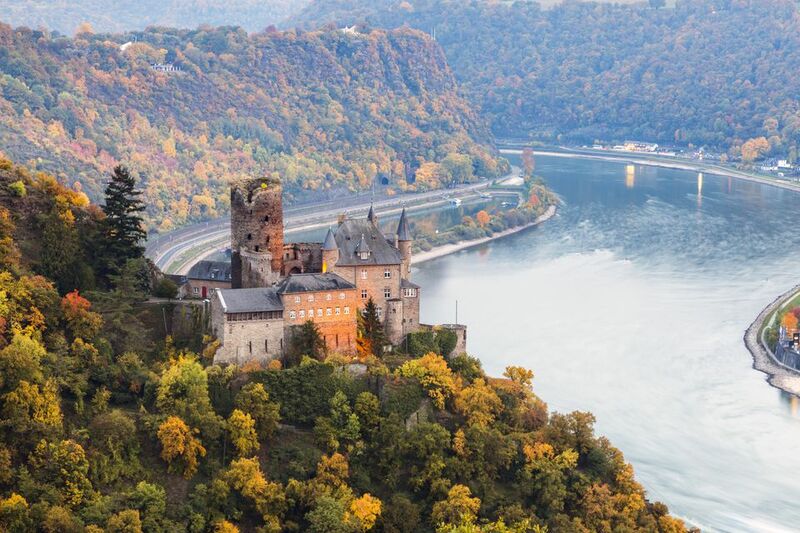 From here, it is just a short drive to Germany's famed Lorelei, an impressive slate rock, which soars almost 400 feet above the Rhine and is the site of many famous German legends and folktales. The Lorelei marks one of the narrowest and deepest sections of the Rhine—a treacherous spot that caused many boat accidents up to the 19th century. According to the legend, the beautiful siren Lorelei was sitting on top of the rock and lured sailors to their deaths. The best way to experience the majesty of the Lorelei rock is certainly by boat. Many towns along the Rhine offer day trip cruises (such as Bacharach, Braubach, or Koblenz). You can also drive up to the top of the Lorelei to get some good views of the region and buy some souvenirs in the Lorelei Visitor’s Center.